More enticing than fruit and more exciting than flowers, fine chocolates are gathered together to create a delicious bouquet, perfect for celebrating a special occasion. Send this rosy "bouquet" of a dozen luscious milk chocolate heart truffles, arranged in a beautiful gift box. One BonBon Blooms™ Sweetheart Bouquet. Box Measures 15" x 5" x 5". 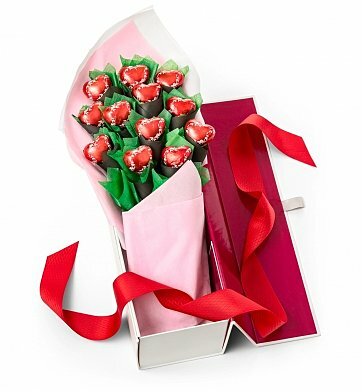 BonBon Blooms™ Sweetheart Bouquet is a hand delivered gift. These gifts are delivered by one of our local design centers located throughout the United States and Canada. Same day delivery is available for most gifts when ordered before the cutoff time. The cutoff time for BonBon Blooms™ Sweetheart Bouquet is in the recipient's time zone. I sent these to my sister for her bday and Valentine%u2019s Day. She loved the chocolates and how it was presented. The only down side was that some of the chocolates fell off the stem when she opened it. Not sure if it was the mail carrier or the chocolates weren%u2019t secured. But other than that! It was an awesome gift!